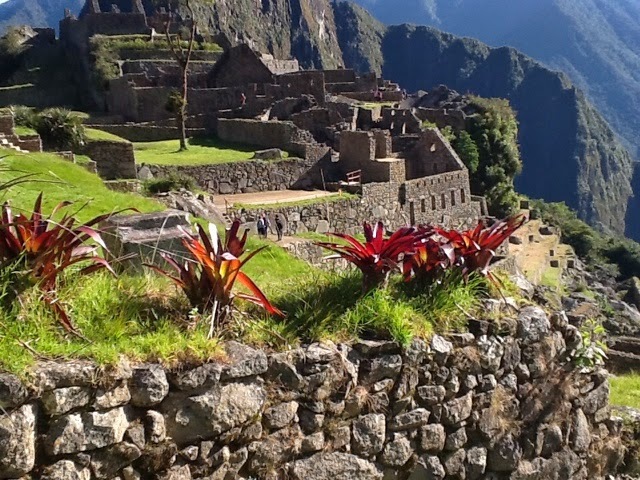 Pam's 50th birthday trip to Machu Picchu was several years in the making. She first started thinking seriously about going when the textbook she was using for her Spanish class had a short reading about it. One of her students said he had been there. The reading explained the three options for getting there: a four-day hike; a two-hour train ride; or a helicopter. Using the romance/cost/comfort trade-off matrix we decided the train was the best option for us. 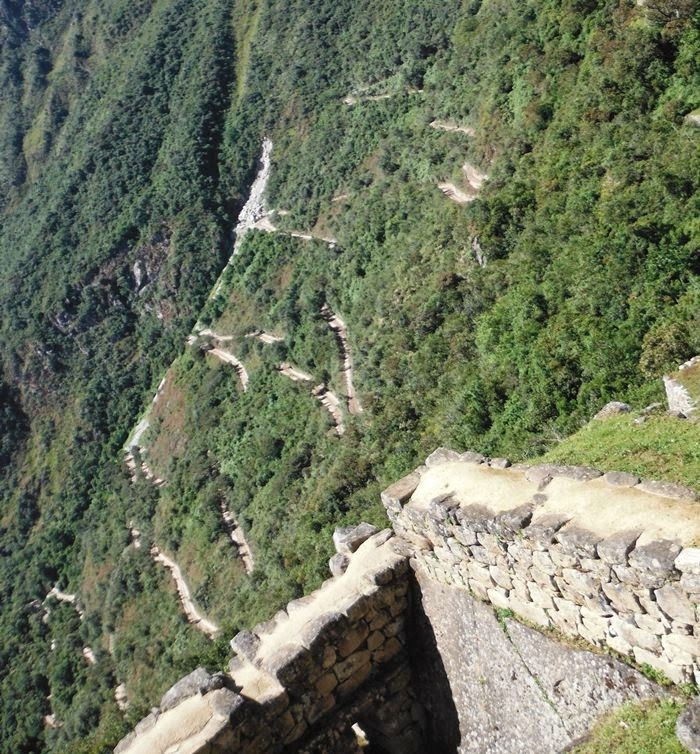 She read more about this special place in Mark Adams' book Turn Right at Machu Picchu. Adams hiked his way in. 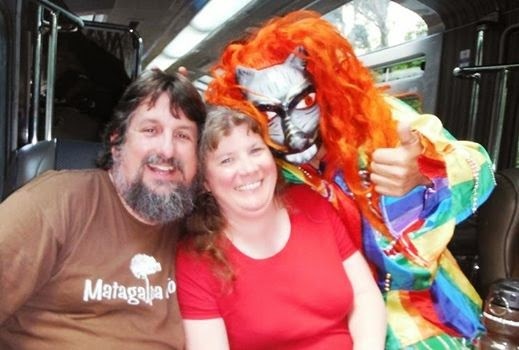 Pam was still convinced the train was right for her, and after all this was to be her birthday! Click on the map to zoom and pan or here to open a new map page to explore the places mentioned in this post. 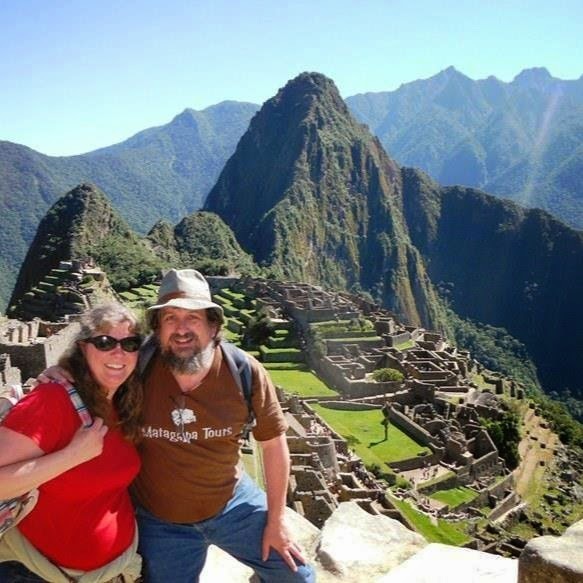 It took almost a whole day of traveling to get to our B&B in Huarocondo, Peru from our home in Bridgewater, Massachusetts. Planes, trains, and automobiles were all involved. We began by reserving a Zipcar which we brought back to our house and loaded up with our luggage. It is fortunate for us that the Zipcars in Bridgewater are parked adjacent to the MBTA train platform, so we were able to get right onto the Commuter Rail to Boston once we parked the car. Once we arrived at South Station we caught the Silver line to Logan Airport. The first leg of the trip was a 2.5-hour flight to Miami during which we had a row to ourselves on the plane. When the beverage service started we both asked for red wine. Because she could not reach her payment machine, the Flight Attendant gave us a half bottle to share, and told us to "party on!" courtesy of American Airlines. The second leg, Miami to Lima, wasn't quite as pleasant, at over 5 hours long, and super crowded. We did each sleep a bit on the plane, although Pam endured a bout of nausea and clung very tightly to James' arm. The final leg -- Lima to Cusco -- was short and again we had a whole row to ourselves. 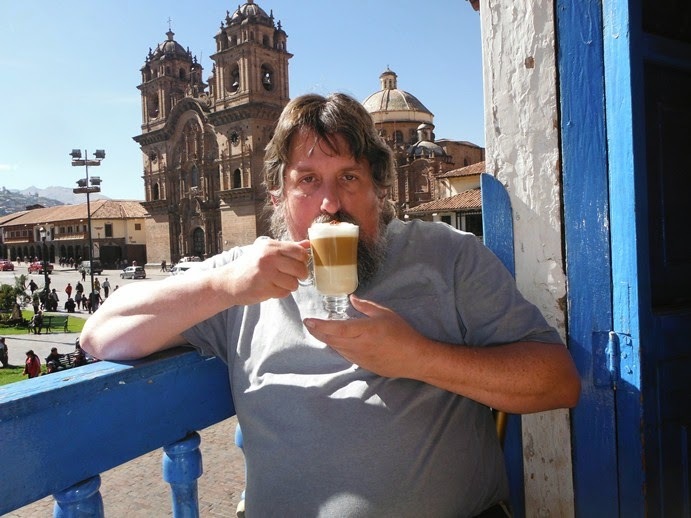 Then we stepped outside the airport into the cool, thin air of Cusco, brushing aside offers of a taxi because we knew we were to be picked up by Lyle, our host from the Gringo Wasi Bed & Breakfast. 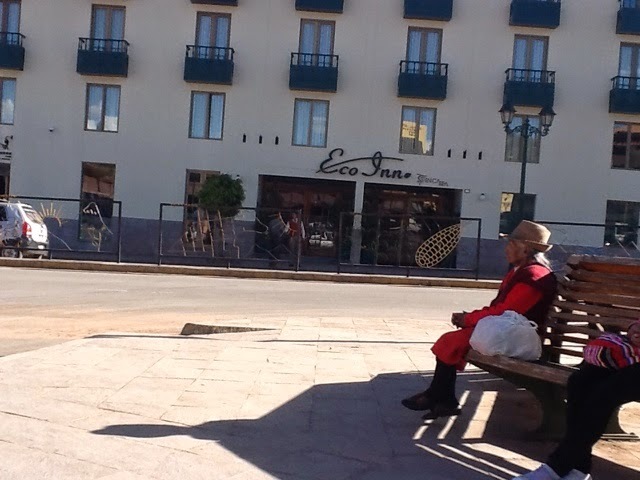 We were a few minutes early, so we did not immediately see him. Several people insisted on trying to help us find him and we assumed they were angling for a fare as well. Eventually we realized they were just trying to help, and we allowed one of them to call the B&B. A couple of confused minutes later, she reached Lyle, who was standing right behind us! 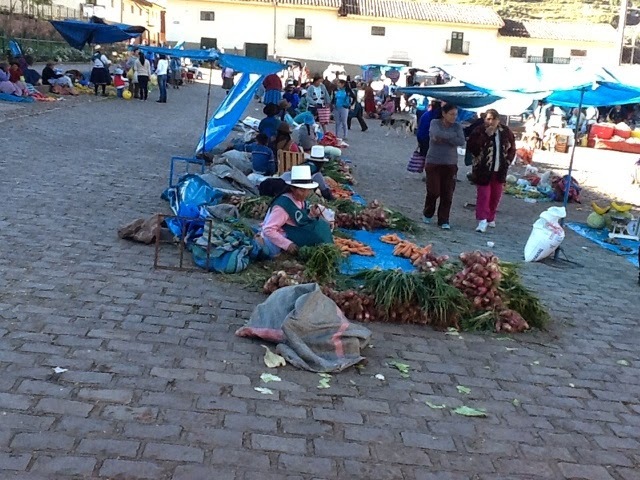 Cusco is best described as bustling and growing. The economy of the region is quite strong, with a lot of construction and infrastructure improvements. Would that our own town were investing as much in improving its roads! 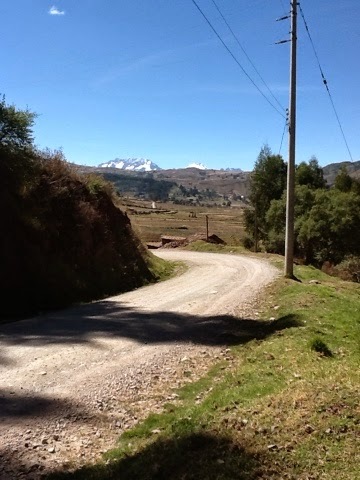 Soon we were winding our way through the streets of Cusco and into the gorgeous countryside. We also had glimpses of the receding though still impressive glacier-capped mountains of the region, about which James wrote "Defrosting" for his blog Environmental Geography. Once we got to Lyle's street in the tiny town of Huarocondo, we noticed a group of animals that included two dogs, a sheep, and a donkey walking without a person. They were clearly staying together though. Lyle said they belonged to the same house where they likely spent the night together in the courtyard. Once inside, we were served a breakfast of tamales, eggs and bread which we slathered with jellies of flavors we had not heard of. We both fell into a long nap as soon as we got to our room, and then took a walk into the center of town -- just a block away -- for market day. Centerpiece at Gringo Wasi. 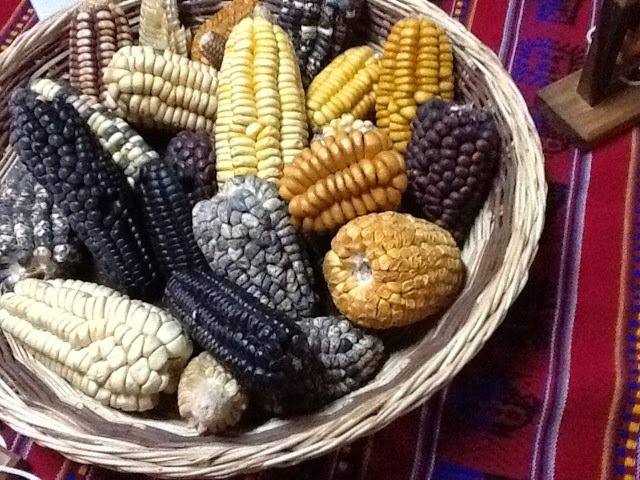 Throughout our stay we were reminded of the incredible variety of corn, which is still celebrated in the Andes and Central America. Threats to that genetic diversity are part of the article "Elevating Profits" that James wrote for his Environmental Geography blog. 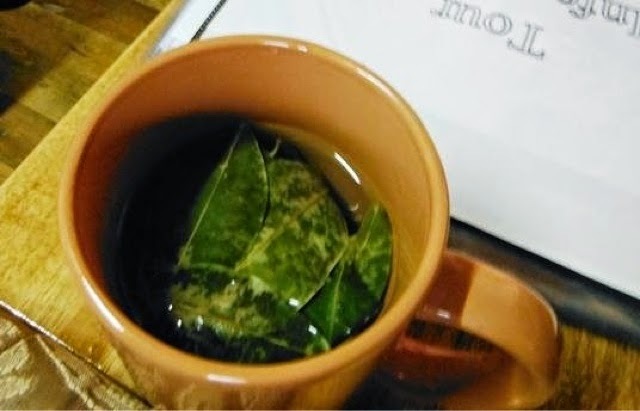 Drinking a "tea" made from coca leaves helped with altitude sickness, and stomach problems. Our hosts keep hot water available in the kitchen at all hours, because those who are not used to the 40-percent reduction in oxygen (relative to sea level) often wake up very short of breath. A cup of this brew calms the heart and clears the mind. 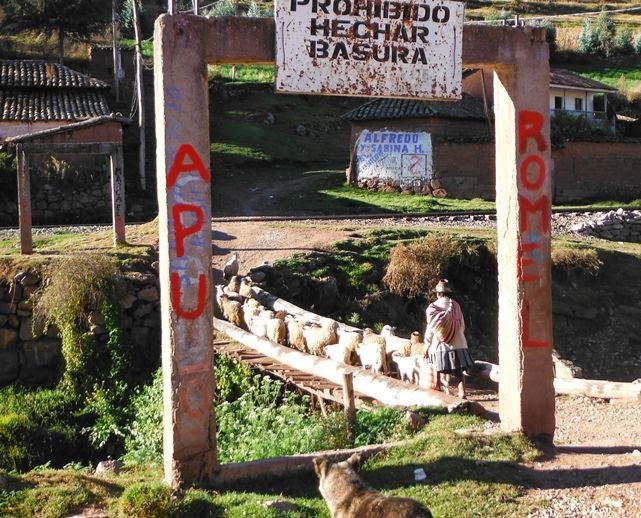 It is unfortunate that non-Andean people have turned this into a vice and even a war. 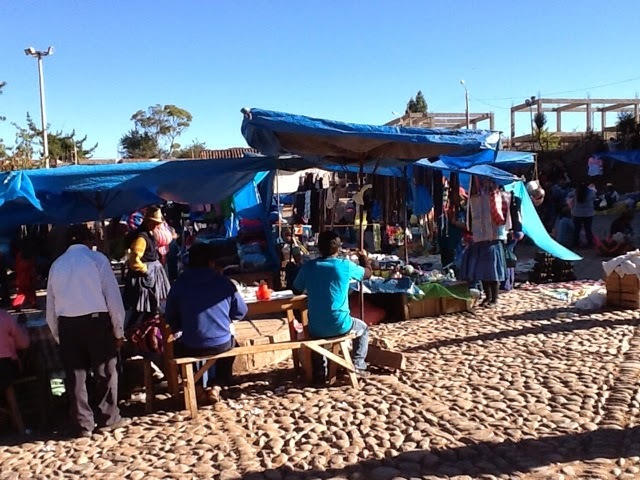 The market was alive with colors and vendors selling everything from fresh produce to ice cream to shampoo to plastic ware. We actually got some shampoo, that being a rather difficult thing to bring on airplanes these days. These flags were on display next to the market. 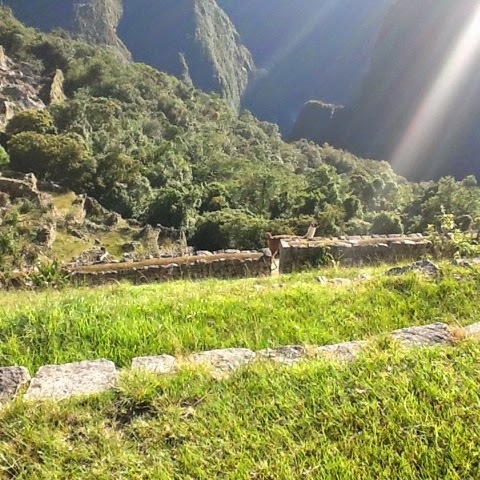 The Cusco flag (Center) is often incorrectly described as the "Inca flag" and looks much like the Pride flag. From the village center, we headed down to the river where we saw what looked to be a defunct bridge, but once we saw a boy and a dog cross it we realized it was not as dangerous as it had seemed from a distance. Walking across it, we actually found it to be pretty sturdy, though clearly it had been a make-shift replacement for a better-engineered structure that had washed away. 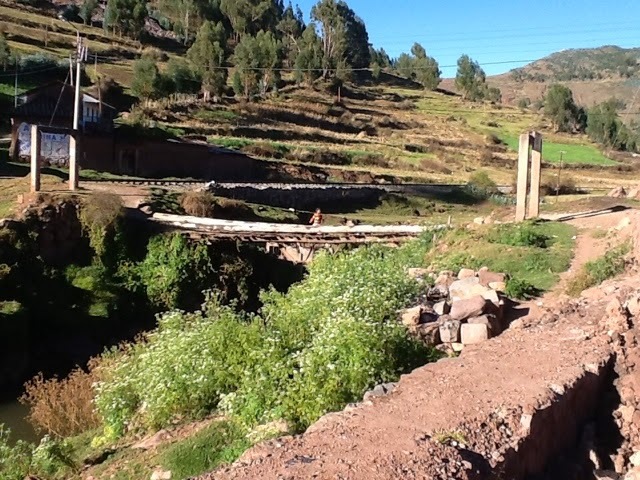 After we crossed the new-old bridge, we watched a woman cross it with her entire flock of sheep. 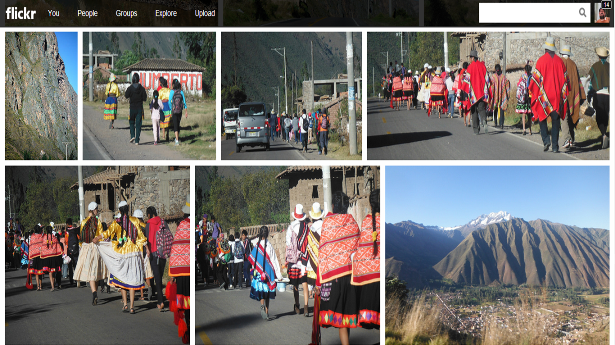 Much of what we saw had a backdrop of lovely Andean pan music. It was like walking through a movie-scape. 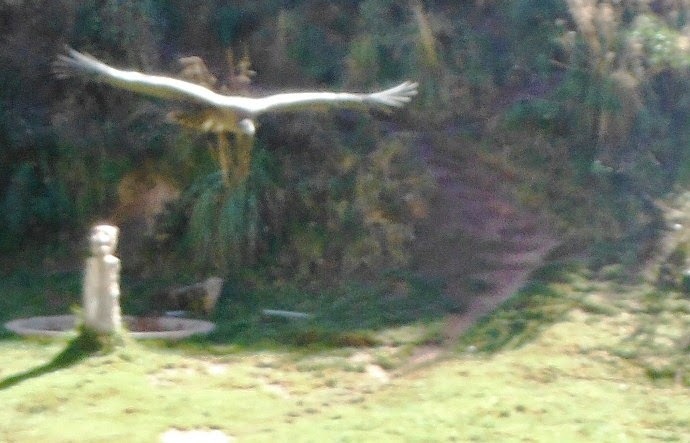 We then found a man walking along the edge of the ravine, hunting for birds with a slingshot. 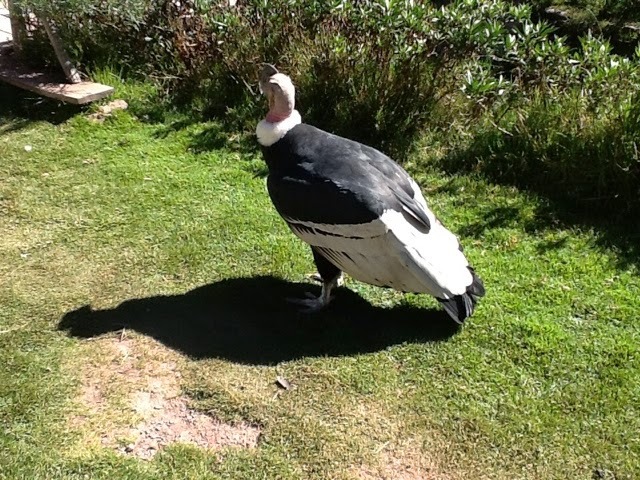 We did not (thankfully) see one go down, but he was both casual and confident enough for us to be convinced that sling-shot birds were a regular part of his diet. In 1989-1990 James worked for an environmental consulting company called Dames & Moore in Cincinnati, Ohio. His officemate was Jeff, a fellow geographer whose grandparents had been from a place called Alice, Texas. In 1994-1995 James actually ended up teaching Geography at an extension of Texas A&M - Kingsville in Alice. A few weeks before our trip to Peru we watched a movie called All She Can which was filmed in Alice, and got us to wondering whatever happened to Jeff. James found him on Facebook within a matter of seconds and they exchanged some messages. 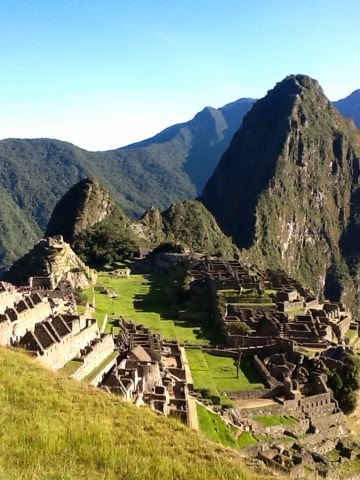 James mentioned that he had to turn down a job-related trip to Cincinnati recently because we would be on vacation in Peru. Jeff responded that he and his partner were going to Peru soon. And, it turned out that our trips would coincide. 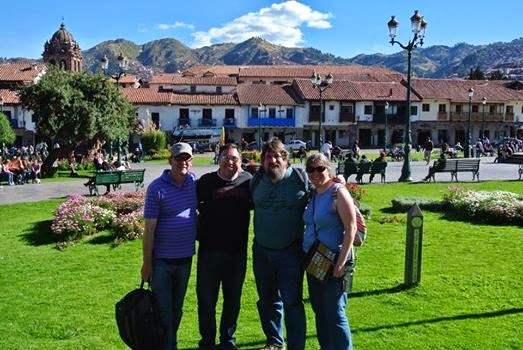 So, 25 years after James left his work at D&M, and perhaps a decade since we lost touch with Jeff, we arranged to have lunch with him in Cusco! 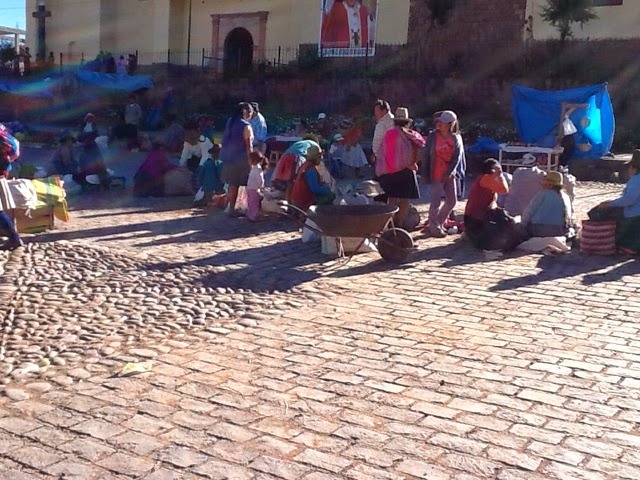 We had ventured some public transportation to get into Cusco. 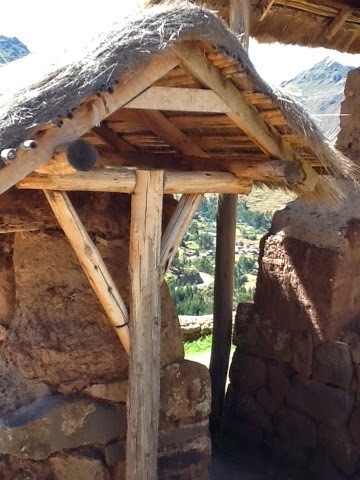 The trip involved two rides in "colectivos": one mini-van ride into the next town, then a station wagon ride into Cusco. Both cars were packed to the gills. The trip took about an hour. 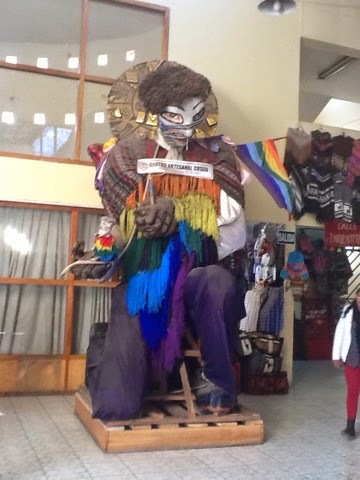 Once we arrived in Cusco we took our time walking to the center-stopping in a market to buy some sweaters and also in a textile and weaving museum. 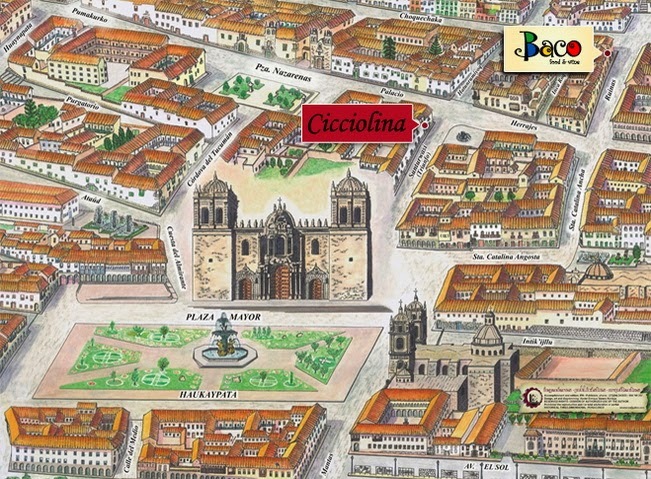 We found Jeff and his partner, JP, right on time at the plaza and they told us that a restaurant, Cicciolina, had been recommended for us. 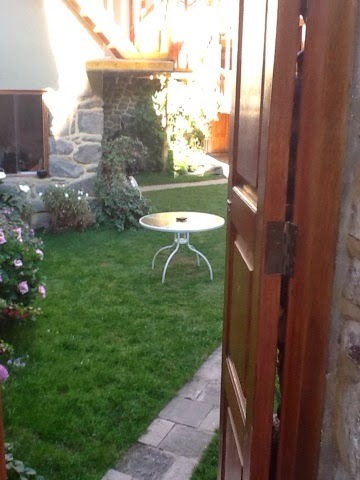 It was a small, elegant place on the second floor of a courtyard. 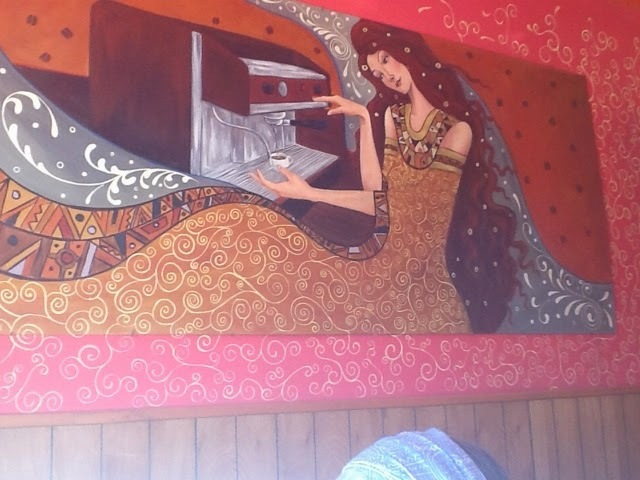 A very nice restaurant in a beautiful and ancient part of the city. 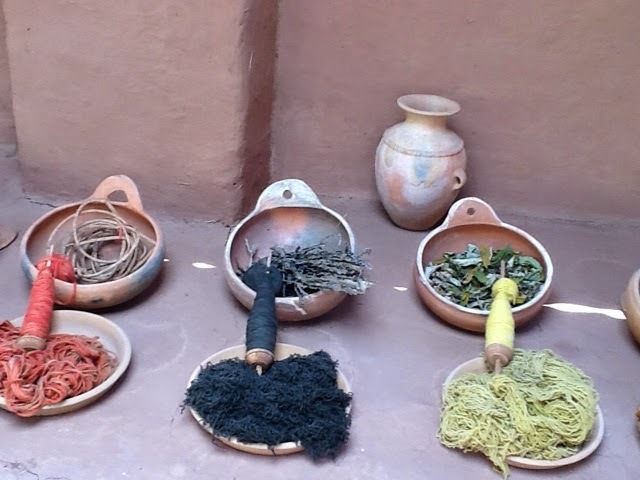 Going into this trip, we knew we would have the opportunity to try three things we do not have at home -- guinea pig, alpaca, and coca. We thought we would try just of one these (the herbaceous item mentioned above), and knew that one of these had been a pet in our home, and so was off the proverbial table. 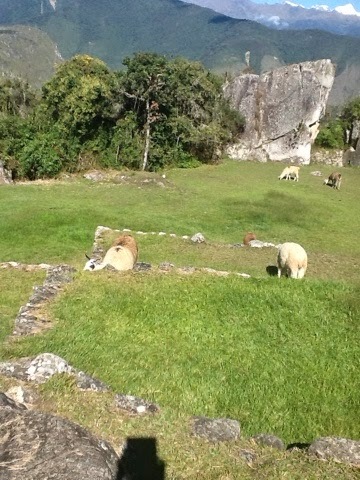 We thought we would resist alpaca as well, but it was during this lunch that we gave in. The alpaca steaks were quite good and very tender and tasted a lot like a good-quality beef steak. 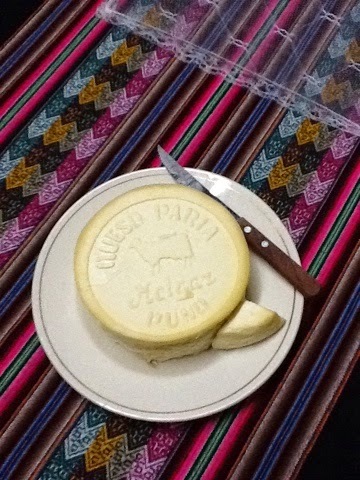 It was admittedly delicious, though not distinctive enough for us to try it again. 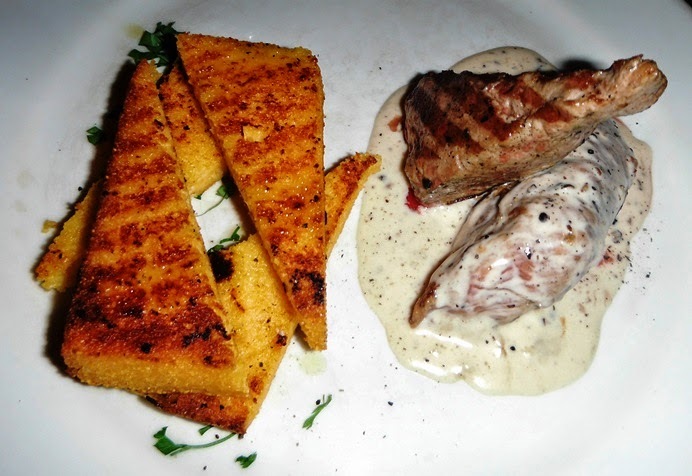 Alpaca in a cream sauce with polenta: just like steak. James also talked Pam in to having dessert -- it was her attainment day after all, and we shared a chocolate mousse served over a brownie and drizzled with butterscotch. It was also served with little cubes of mint gelatin. It was remarkably not too sweet and perfect for sharing. Jeff and J.P. shared a caramelized banana. 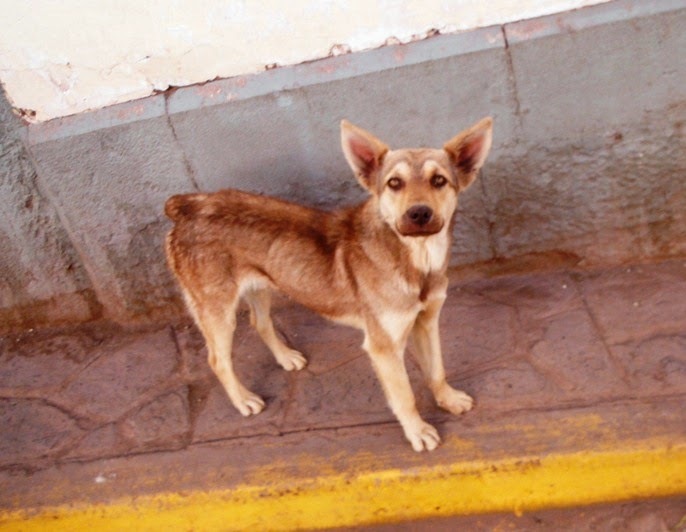 Our return trip to Gringo Wasi was not quite as simple as the trip into town had been. The first collectivo had dropped us off a couple of blocks from the usual pick-up point, so we had to ask several people where to find it when we were returned to an unfamiliar corner. Even after we found the big yellow sign indicating the bus terminal, we still had trouble finding the buses, because they were in a courtyard around a corner from the terminal sign. We also discovered that the mini van we rode in on wasn't as packed as we thought it had been: there were a couple of "secret" seats that were utilized on the return trip, so we had even more company for the return ride! A beautiful day for Pam's 50th birthday! 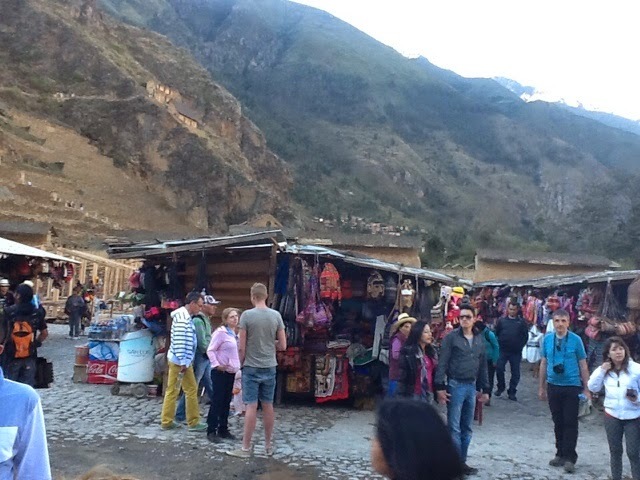 We woke up at 2:30 am in order to be ready for a 3:00 departure from GringoWasi to get to the 4:30 train from Ollantaytambo to Aguascalientes. 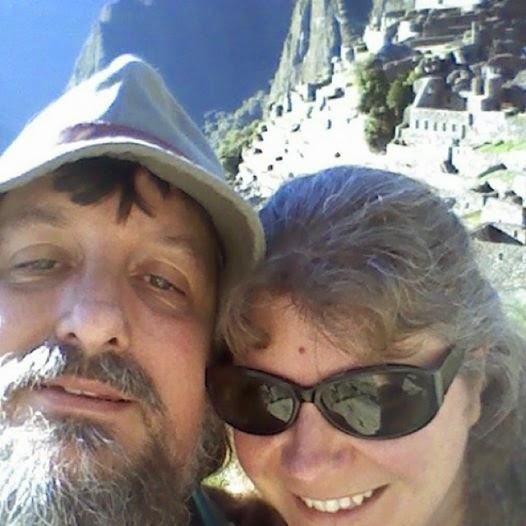 We arrived in Aguascalientes (so named for its natural hot springs) at 6:30 and caught the bus up to Machu Picchu. NOTE: A visit by train does indeed require transportation to the train, transportation on the train, transportation from the train, and a ticket into the park itself. Even off-season, reservations are required and sometimes hard to get. A bit of research is required to figure out which combination of riding and walking works best for a given traveler. Nobody gets in for free, though! 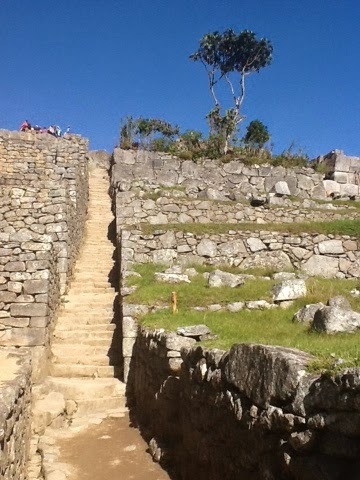 We stopped to use the one-sol-per-pee restroom before heading up to the ruins. You'd think you'd be able to pee for free with the price of the $30 admission, but you would be wrong. Toilet paper was on a roll at the "toll booth" which you had to take with you. 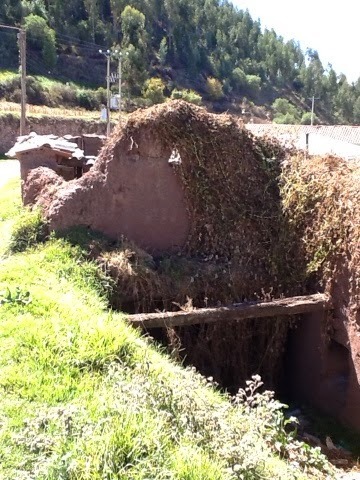 Since there are no "baños" inside the park it was worthwhile to go before entering. 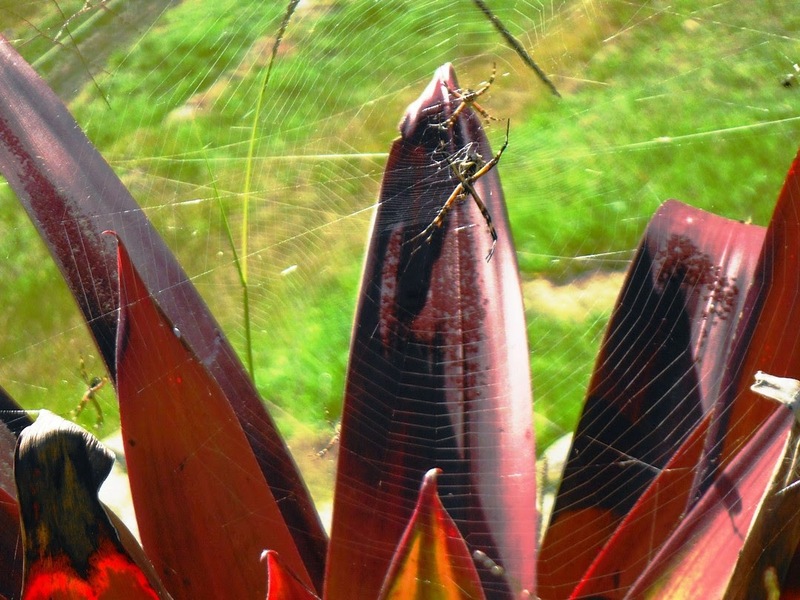 Once inside, we saw llamas, a lizard, and some lovely spiders on their webs. We did a lot of climbing. There were loads of crowds there (and it was not even the busy season yet), and the sun was hot, filtered through only about half us much atmosphere as we are used to! As the morning wore on we became increasingly glad that we had taken the first train in. This is most of the bus route, and there is a bus in the photo, believe it or not. We have heard that it can be walked in two hours, but could not picture ourselves doing it that fast! The ruins were everything we had imagined. So beautiful and magical. It is hard to believe that they were built by hand. 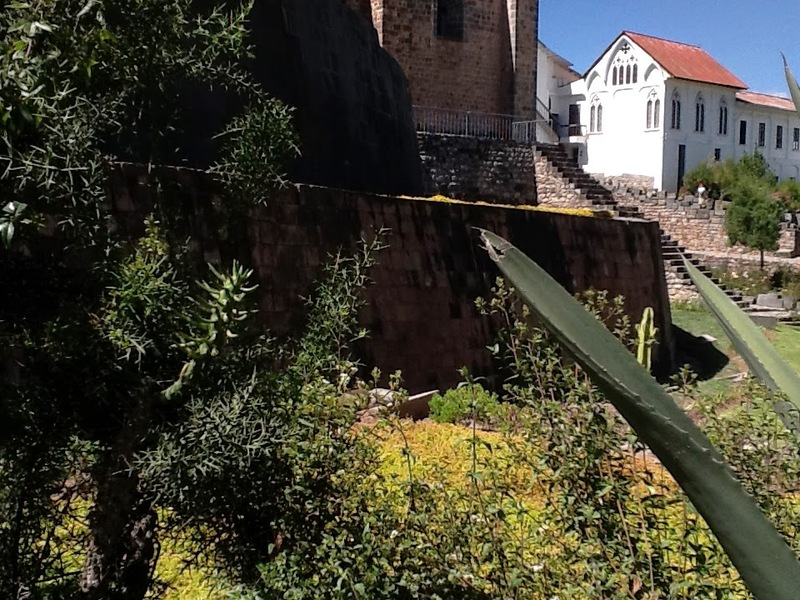 It is also hard to imagine that this is one of several sites of a similar scale that went missing -- as far as Spanish colonizers were concerned -- for several centuries. 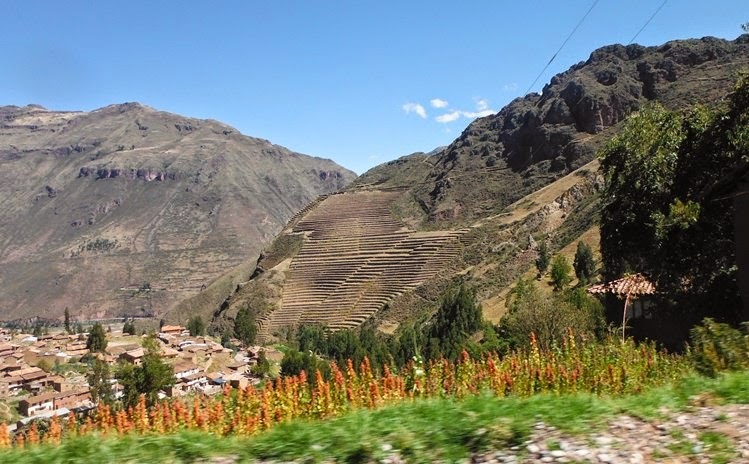 The terraces are impressive, and people of the region continue to employ them in farming on slopes that most people would consider unsafe even for walking. 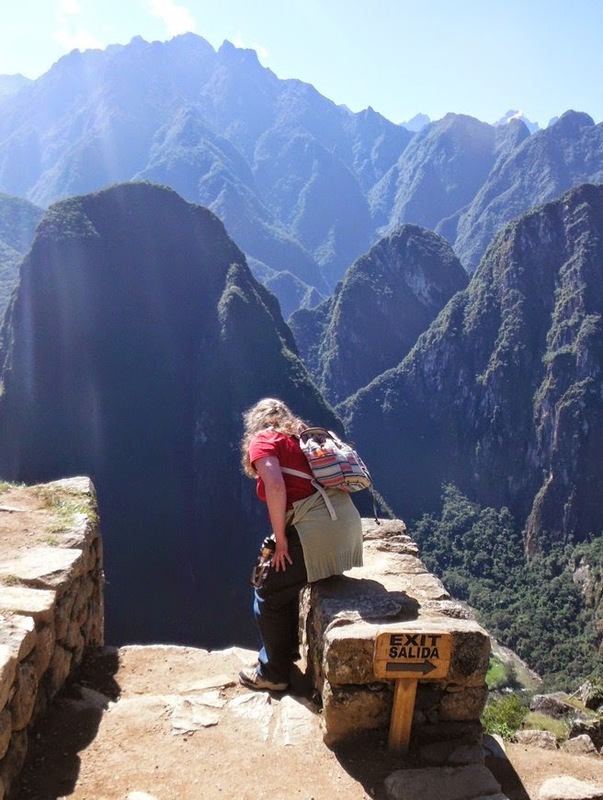 When Pam was taking in this view, James was behind her, thinking she was about to fall into the abyss! James is usually the arachnophobe, but he moved in for this close-up. We saw llamas just walking around. We saw this one only because so many other tourists, er, travelers had stopped to photograph it. As James remarked, "That lizard is famous on six continents already." 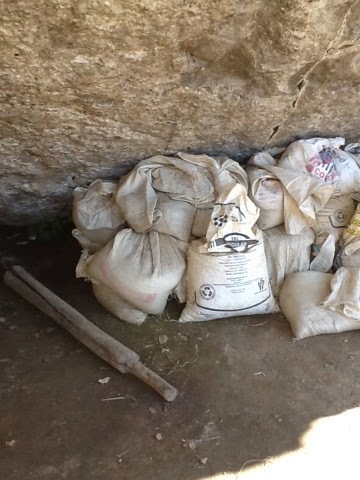 These bags of salt were stashed off the beaten path. We had no idea why. Jeff and JP have a picture of themselves in the exact same spot, as do many visitors. Sometimes there is a reason that a lot of people do the same thing, though. Pam recently learned that a "Selfie" with the person you are in relationship with is called a "Relfie" and are apparently annoying to your Facebook Friends. Hope this one didn't cause too much consternation. This is one of those really cool 3D postcards. We actually intended to send it to someone, but never did figure out where to get stamps. 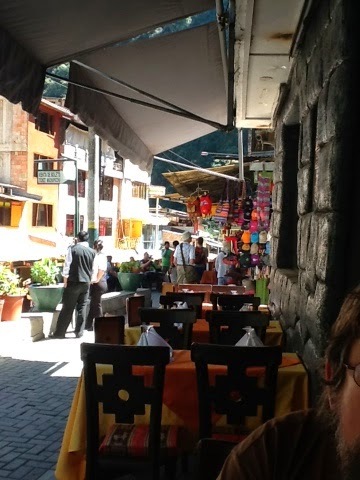 We took the bus back down to town and had lunch and did some shopping before meeting the train back. Pam had chicken in yellow chili sauce with rice, potatoes and onions. James had a deep-fried chili relleno. Both our dishes were served with the yellowest potatoes we ever saw. 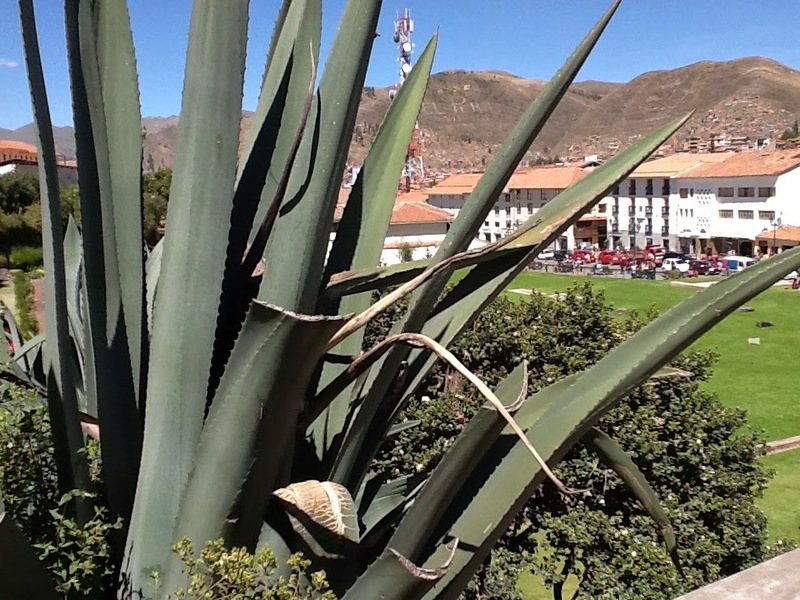 We both tried a Pisco Sour, the national drink of Peru, which tasted a lot like a whisky sour. This was all served with a music track featuring the 80s music of our youth (Patty Smyth, The Police, Lionel Richie, etc.) 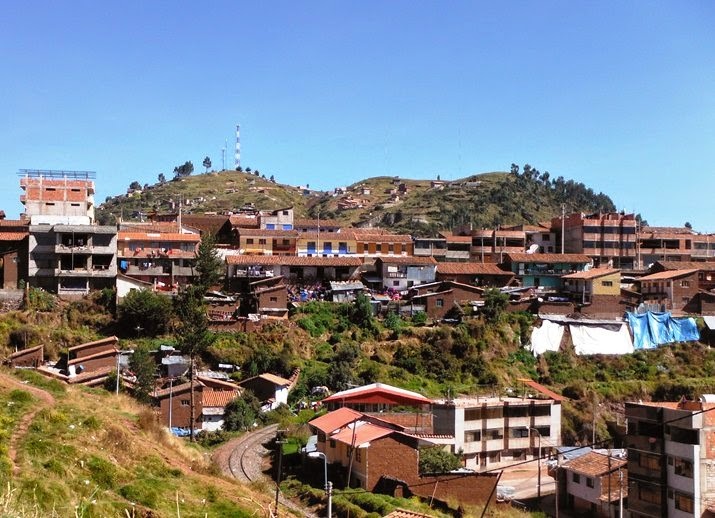 We also noticed that all of the shops and restaurants above us received deliveries from the train which were then carried by hand up the hill to where they were needed, reinforcing our impression of a very strong work ethic we encounter wherever we go in Latin America. After lunch we bought a small rug for our room at the market. Exhausted from climbing in the sun we made our way to the train station for our return trip. As tired as we were, sleeping on the train was really not an option as the ride back was more of an experience than the dark trip in was. 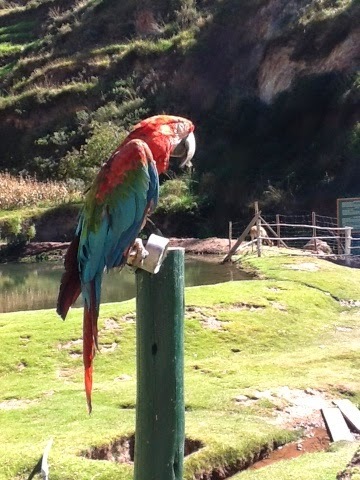 Not only were there beautiful vistas to look at, we had entertainment in the form of a wolf-clown and a fashion show. We both decided to try Inca Cola for our refreshment on the train. It was super sweet and tasted like a mixture of cream soda and bubble gum. The dark yellow color was rather unappetizing - it looked like a sample you might submit for a drug test. 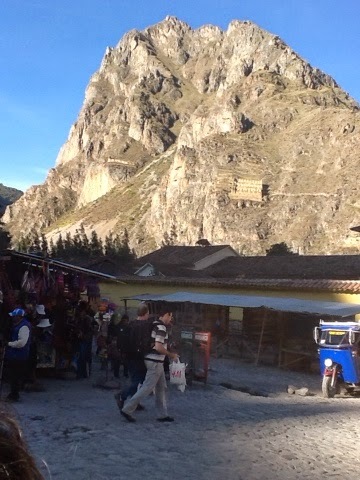 Lyle met us at the train station in Ollantaytambo where we waited a few minutes over frozen cappucinos for our fellow B&B mates to return from their day's adventure. We took a wonderful scenic route back and actually had to wait while a flock of sheep and their shepherdess used the road. 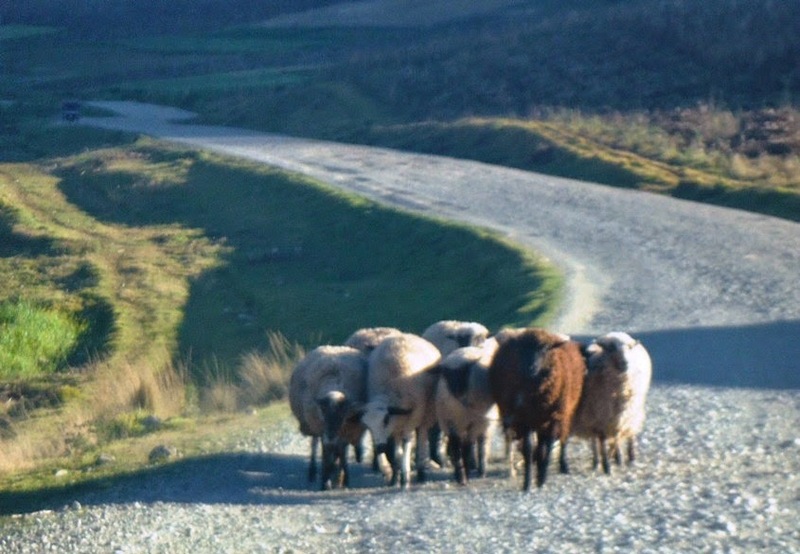 The sheep below are on the same road a day or two later. This time, we stopped only for photographic purposes. 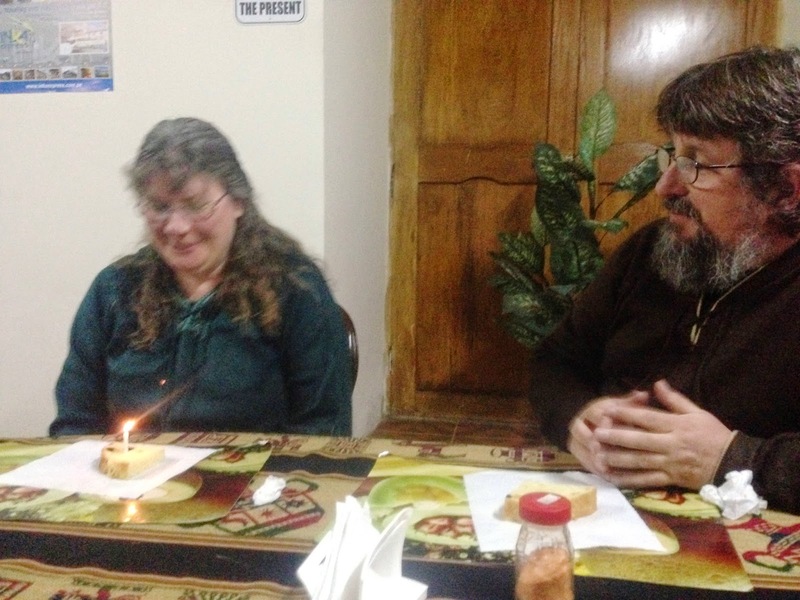 The whole point of this trip, of course, was to celebrate Pam's birthday, and our hosts and fellow guests at Gringo Wasi helped us to do just that. 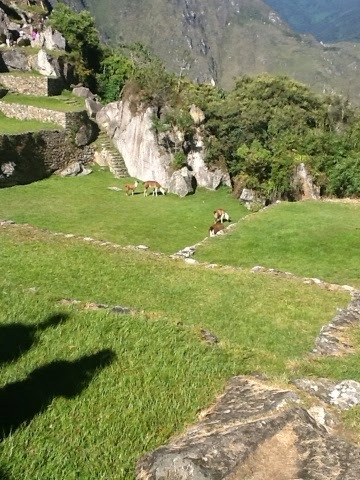 We took a rather long walk from the B&B to some ancient terraces just outside of Huaracondo. We spoke to a few local folks along the way and saw loads of livestock. A small German Shepherd-looking dog followed us for part of the way, heeling better off-leash than most of our own dogs have done on-leash. She then stopped when we stopped, posing to have her picture taken, and escorted us to the edge of the village. 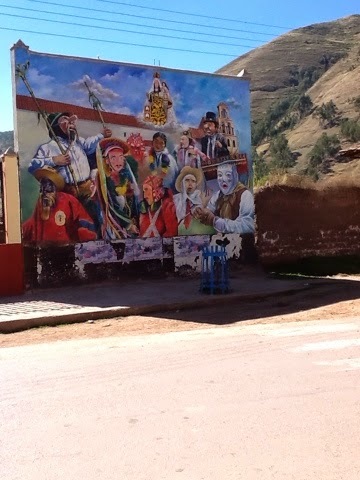 During the walk we got a close-up view of an incongruous poster we had seen throughout the Sacred Valley region. It took James several days to work out the critical geography of this one image, which he describes in the post Elevated Profits on Environmental Geography. 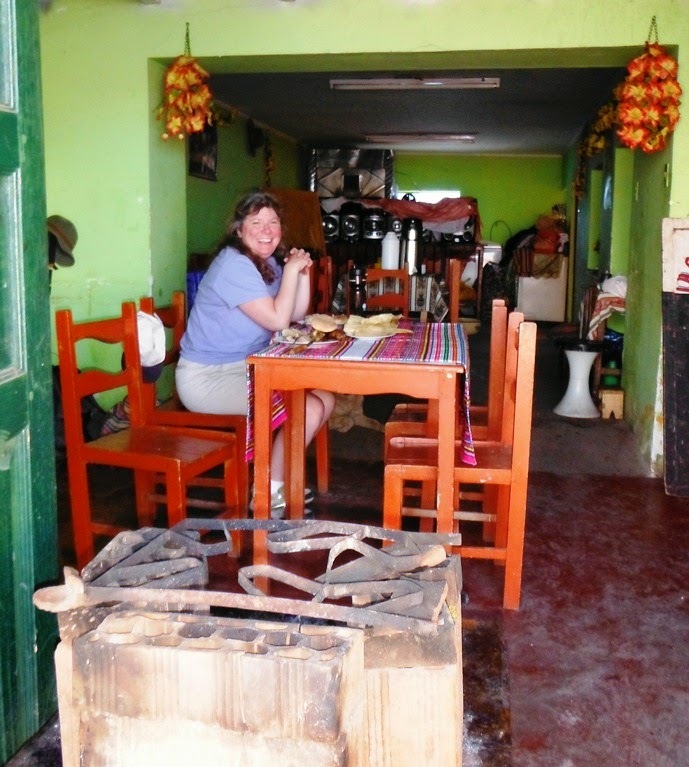 We ate lunch at La Casa del Lechón, just down the street from Gringo Wasi. 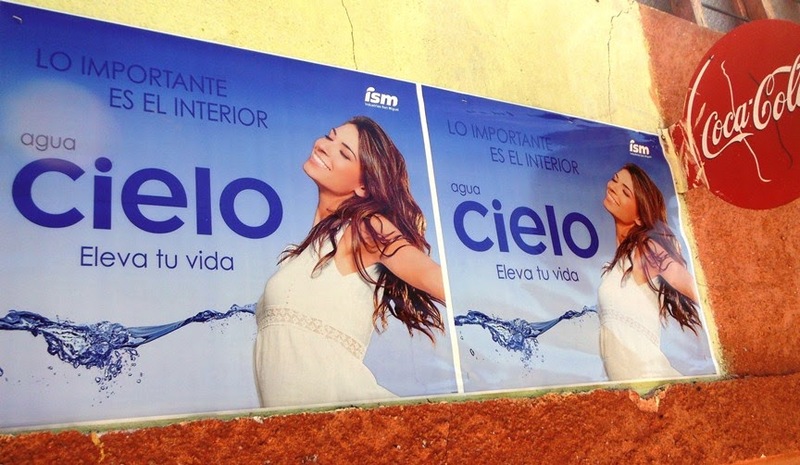 It is "muy local y auténtico". Lechon is a local dish made of pork. 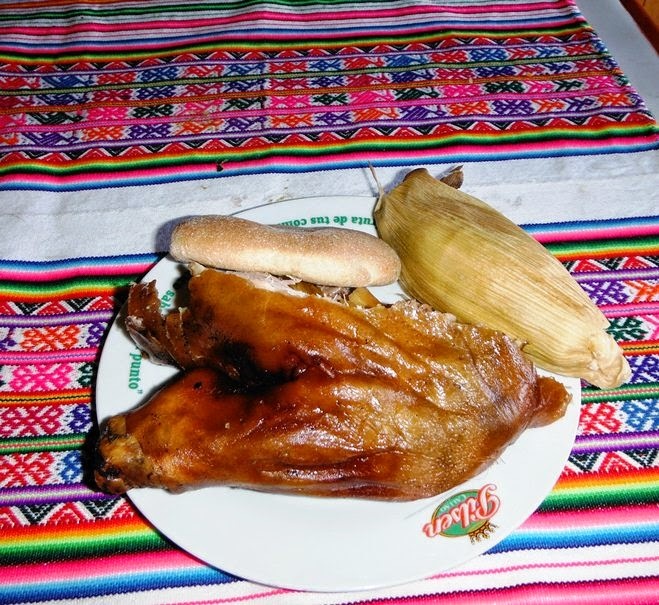 Our plates were also served with a sweet corn tamale, and a piece of bread. There apparently was only the one dish on the menu. The restaurant had two dogs wandering through it. There were several people working there. We assumed they were all related. It took four of them to get us the beers we requested. James asked one of them for the drinks, who told someone else who went somewhere else to buy them, then a teenage boy brought in two clean glasses and put them on the counter, another teenager then came in and asked us who they were for (we were the only customers). 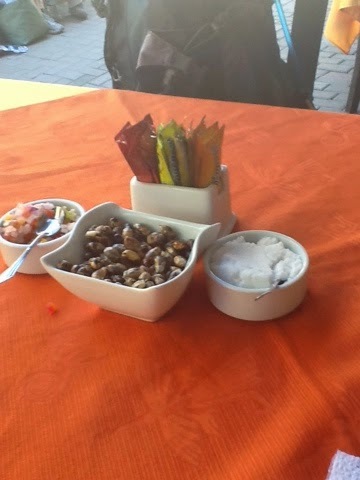 We told him they were for us so he brought them to the table, then the guy who went out to buy the beers came back with them. A roll of toilet paper was brought to the table in lieu of napkins. A very authentic atmosphere by day apparently gives way to quite a party scene at night, judging by the number and size of the speakers stowed in the back of the room! Tourism, thankfully, has not yet had much affect on Huarocondo! "I am the brat of Haurocondo! What's it to you?" 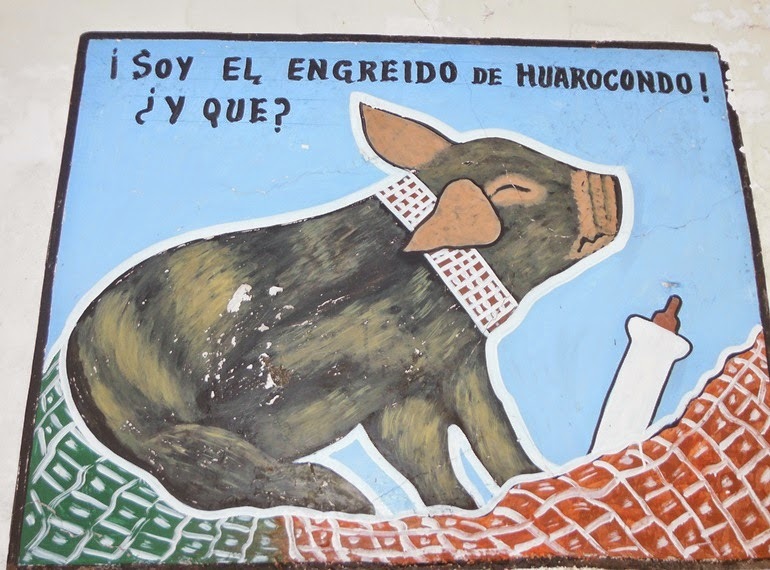 A morbid sense of humor seems to pervade the lechón industry in Huarocondo, which holds an annual festival for the dish. 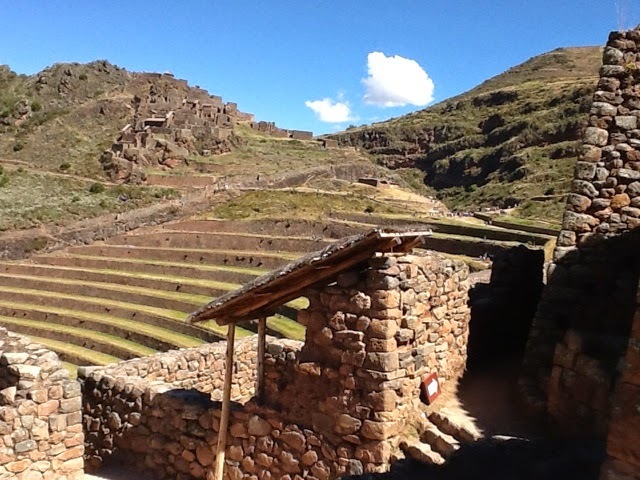 A driving tour of the Sacred Valley was on our agenda for today. Our hosts at Gringo Wasi arranged for a private driver to pick us up for one of several standard tours they have mapped out for guests. 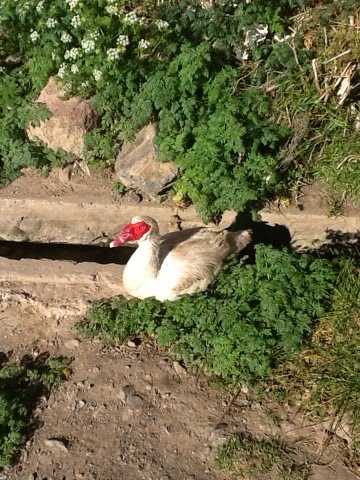 We were taken to the animal sanctuary for our first stop. 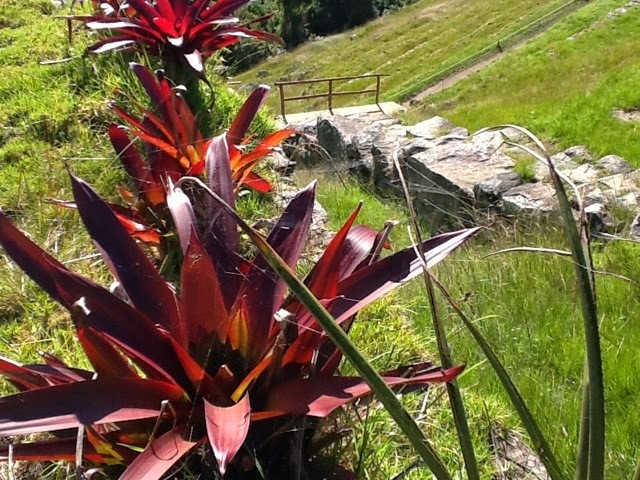 We were greeted by a guide who asked whether we wanted to have a tour in English or Spanish. We said Spanish and were glad we did. Both of us understood virtually everything. I only had to ask for clarification of one word. 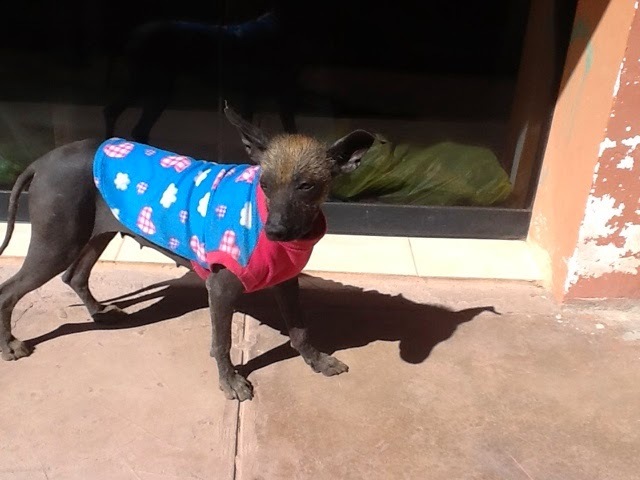 We saw several of these virtually hairless dogs (with mohawks) and usually with a sweater while traveling in Peru. Some people think they are "Chupacabras." 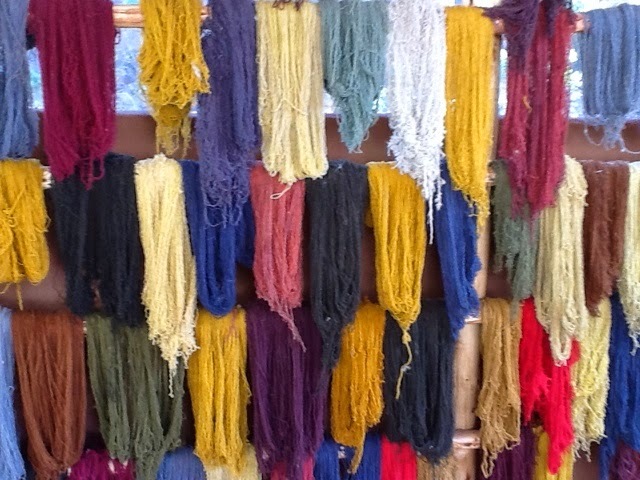 The Sanctuary also had a display that included information on how to spin llama wool into yarn, and tint with natural dyes. 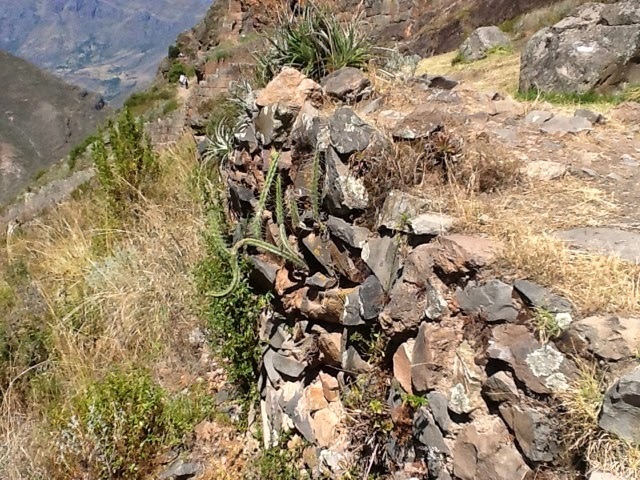 Next we went up to the Sacred Valley and explored the ruins at Calca and got lost trying to find our way down the hill to our driver. We wound up taking a taxi down. 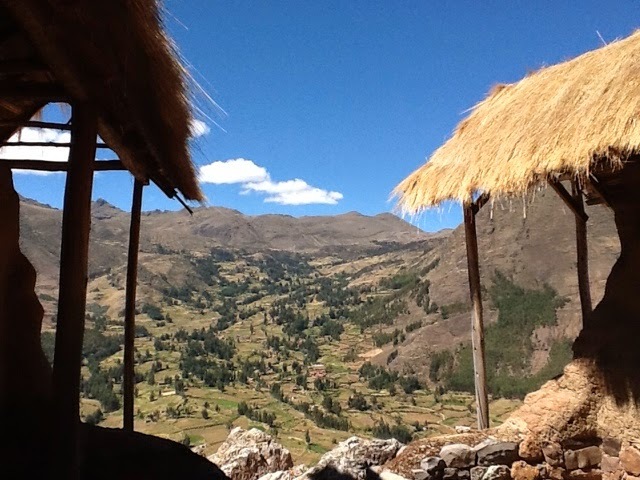 Pam started to experience a bit of altitude sickness and the heat was getting to both of us. 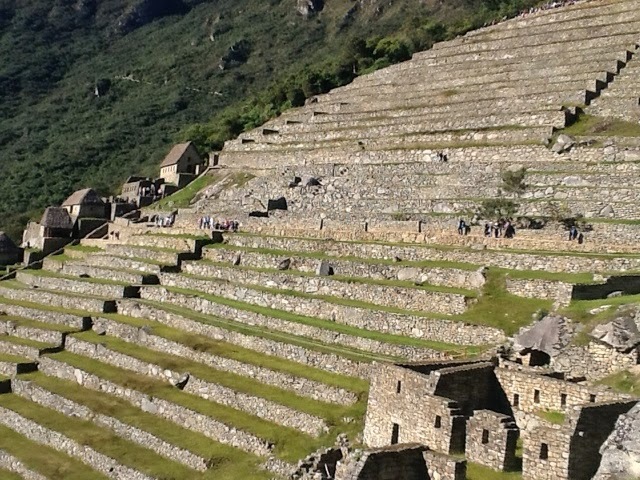 Nonetheless, this was a worthwhile part of the journey, where we saw different building styles and terraces that are still in active use. 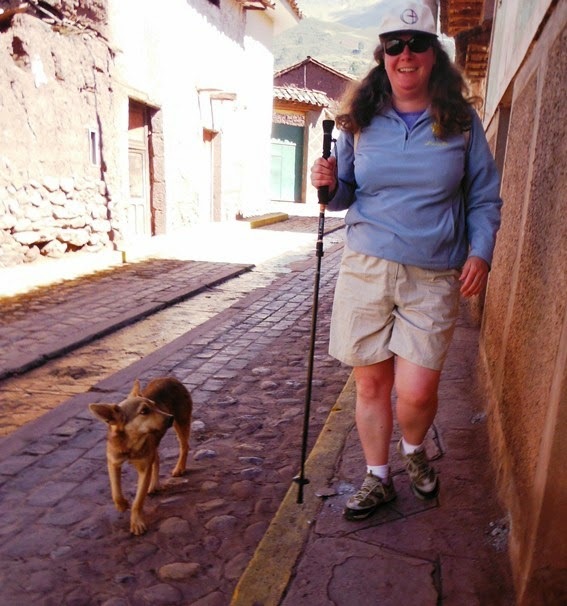 We were both planning to take it easy at Ollantaytambo but we never actually even made it to the ruins at all, as Pam twisted her ankle on the way to the ladies' room at the restaurant where we were having lunch. This just seemed particularly ironic after all the hiking and climbing we did. 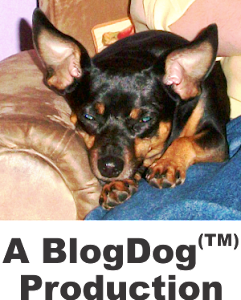 The pain made her nauseous, so we called our driver and asked him to come get us and take us back to the B&B. 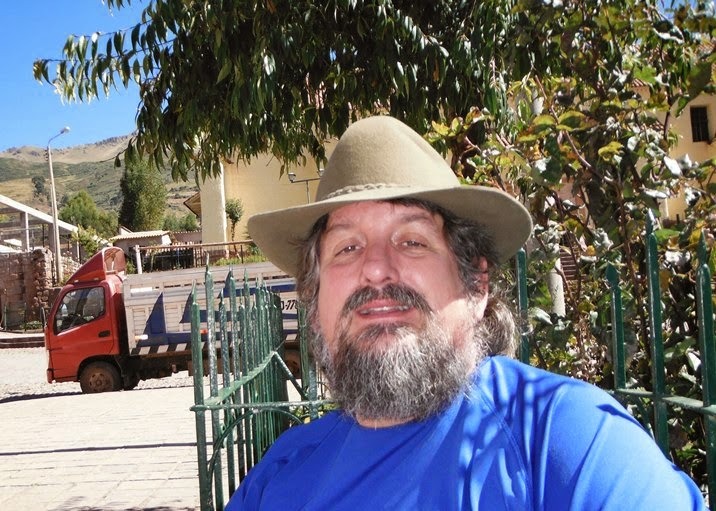 We returned to Cusco with two of our B&B-mates (sisters Kate and Rebecca). We stopped in a cafe located on a second floor, and got a table on the balcony overlooking the Plaza de Armas. As a big coffee-shop geek, James loved the plaza-side balcony. And the coffee was quite good as well. We even inquired as to the roaster and were given directions to a source a few blocks away, but by the end of the day we had forgotten to go back there! 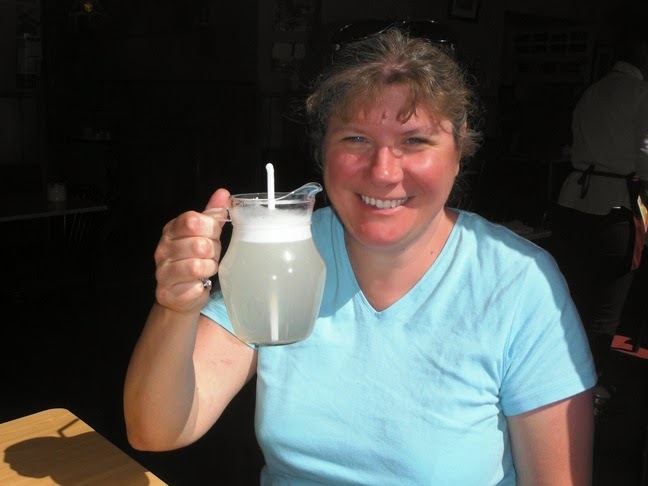 And the lemonade was great, too! While we were enjoying our drinks we noticed a crowd gathering and realized there was a parade featuring some very small people in honor of National Early Childhood Education Day. Next stop was the Chocolate Museum (ChocoMuseo). It was quite small. The exhibits were simply signs around the walls. Otherwise, there were a lot of things to buy. We might have enjoyed it more had we stayed for one of the workshops. Next to a Contemporary Art Museum which James and I could not get into without purchasing a tourist pass. We didn't want to spend the extra money, as we had already purchased a half pass without being able to take advantage of all of the attractions on it, due to Pam's injury. 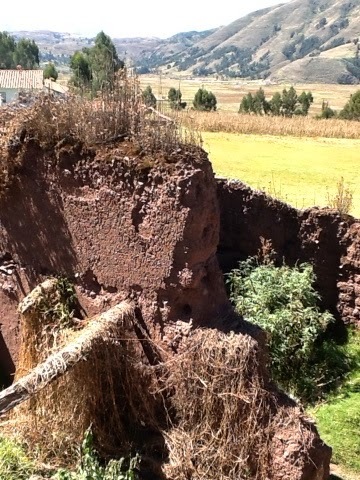 So we headed to the Inka Museum which had a much more reasonable admission charge of 10 soles (about $3). It is a really good museum with very educational and engaging exhibits. and James got a hat to replace the "adventure hat" he had lost the day before, after many adventures over the past several years. 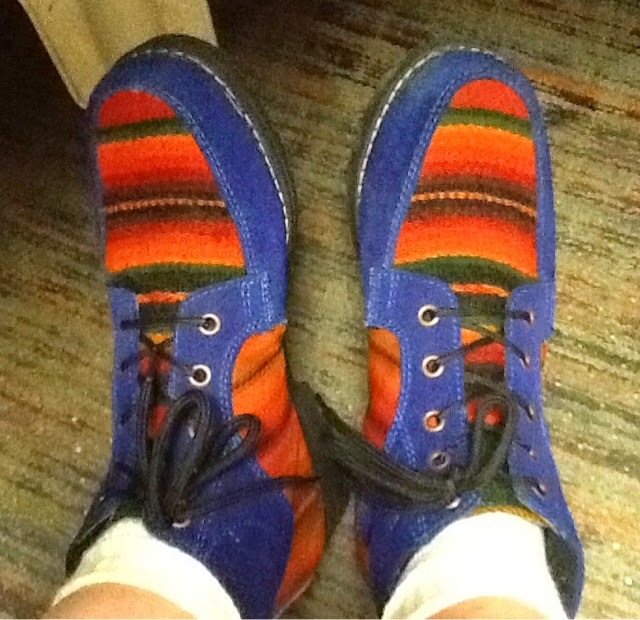 The replacement is even more adventuresome, though only suitable for cool weather. 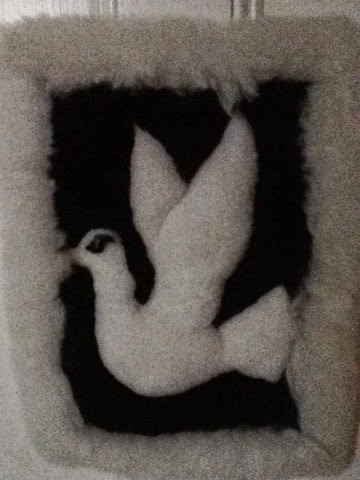 We also bought a small dove-design wall hanging made from llama wool, and a carry-on bag woven from llama wool. As we were leaving we heard an alarm which we ignored, as a similar alarm had gone off about ten minutes prior and no one seemed concerned. Pam stopped to take a picture of this cool statue, and someone told her to move along. It was then that we realized that everyone was evacuating the market. Picture taken from the taxi while waiting in traffic. We bid adieu to our friends and hailed a taxi. We got in and were immediately stuck in traffic. The driver told us it was a nation-wide earthquake drill, then we heard the announcer on the radio say in Spanish it was 'incredible that the police didn't know that there was a drill today'. 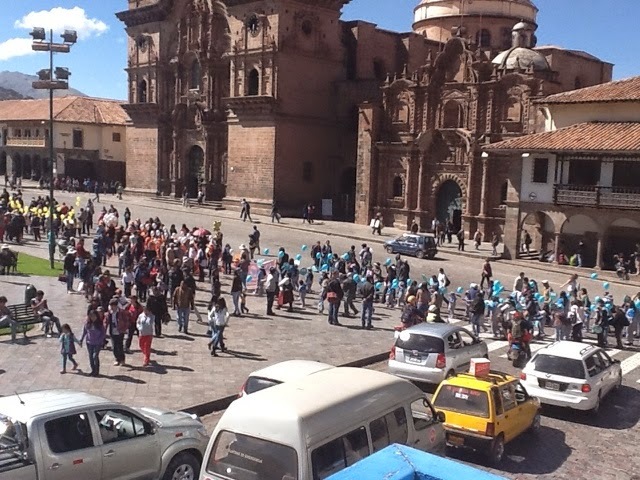 The stop gave us the opportunity to record the only video from our trip -- the very cool "cross" signals used in Cusco. Once traffic got moving again we made it to the colectivo station where we could get a colectivo to Izcuchaca and another from Izcuchaca back to Huaracondo. There were four adults crammed into the back seat of the car (a station wagon). One small woman was sitting on another's lap. Dinner was "papas rellenos" back at Gringo Wasi - (mashed potatoes rolled into oblong shapes and filled with meat, vegetables, raisins, and hard boiled eggs). I think I tried to make something similar once, but it didn't turn out quite as good. 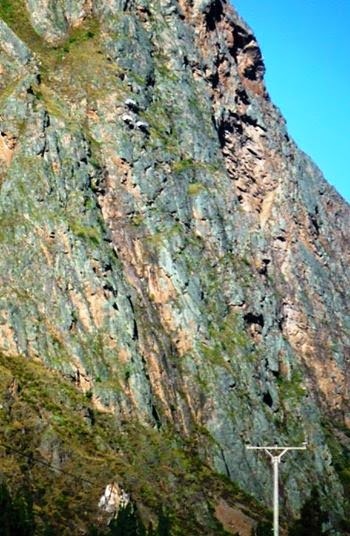 Even harder to find than the face in the mountain, this mountain has a hotel on the side! It is actually visible near the top of this photo! Our return trip to Bridgewater was, thankfully, rather uneventful. We did have a rather long (6 hour) layover in Lima during which we enjoyed a nice meal, and took advantage of the airport massage service. The final leg of the trip was with MCS Limousine, which we probably should have used for our departure. Whenever we make arrangements with this local company, we know that once we get to Logan -- at whatever hour and in whatever weather -- we are as good as home. 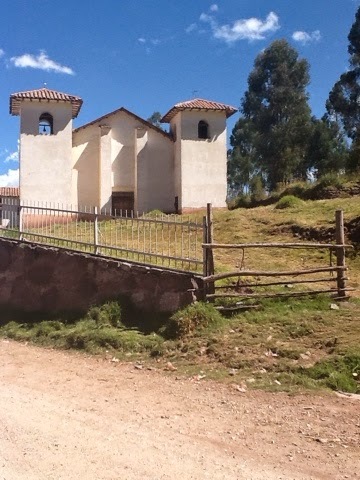 To see even more photos from our journey, explore James' Cusco 2014 Album, one of several dozen image sets he shares on Flickr.